Synopsis: A secret government agency recruits imprisoned supervillains to execute dangerous black ops missions in exchange for clemency. Review: About halfway through Suicide Squad, a dejected looking Deadshot (Will Smith) remarks “For a few seconds there, I had hope”…and he’s on to something. The pre-credit studio/production company logos have a dirty neon sheen to them and I felt the briefest tingle of excitement, some eager optimism that the last big film of the summer would be swooping in to save an otherwise lackluster season of good but not great entertainment. Instead of saving the day this stinker of a superhero film winds up burning down the house in a most spectacular fashion. Warner Brothers and DC Comics continue to have a major identity problem, which is causing a sizable rift in their plans to build up a superhero universe franchise to rival Marvel Studios. Though they possess the most recognizable caped characters of them all (Batman and Superman) they haven’t yet been able to deliver a fully satisfying entry, or at least one that pleases both the critics and the audiences. Man of Steel was too dark, unwisely going the route of The Dark Knight’s gloom and doom and while I wasn’t as out for blood as the majority of critics were, Batman v Superman: Dawn of Justice had such significant structure problems that it wound up collapsing under its own turgid weight. It’s easy to imagine that with BvS underperforming all eyes turned to Suicide Squad to right a listing ship and it’s not hard to see that this film has been heavily fussed with…to the point where it’s plot is almost completely incomprehensible. I’ve no doubt that writer/director David Ayer (End of Watch, Fury) had a plan going into production but wound up bowing down to the studio heads and compromising his vision for the sake of the franchise, not to mention watering down the violence/language to fit into an ill-advised PG-13 rating. There are a lot of characters to introduce and the movie is a herky jerky stumble through of brief origin stories, none of which feel long enough or inspire any sort of investment of interest for the next two hours. Deadshot (Smith, Winter’s Tale) is shown as both a family man and top-priced assassin, captured by a cameo-ing crusader in front of his young daughter. 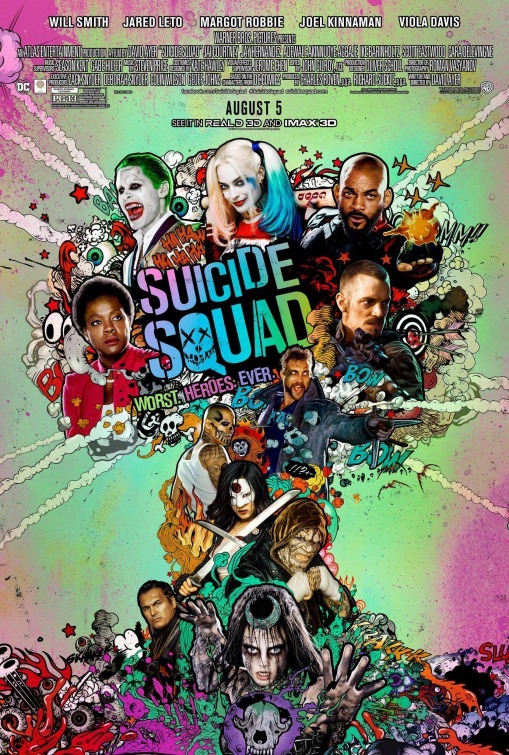 Harley Quinn (Margot Robbie, The Legend of Tarzan) turns to the dark side after playing head games with her former patient, The Joker (Jared Leto, Dallas Buyers Club) while inner-city gangbanger Diablo (Jay Hernandez, Bad Moms) spews flames whenever his temper gets the better of him. Rounding out the group is Boomerang (Jai Courtney, The Water Diviner), Killer Croc (Adewale Akinnuoye-Agbaje, Trumbo), and Enchantress (Cara Delevingne, Paper Towns). The lone squad member given zero introduction is Slipknot (Adam Beach) in appearance so brief I’m shocked he wasn’t edited out completely. All of these rogues were rounded up by Amanda Waller (Viola Davis, Prisoners) a morally stunted government agent that sees using bad guys to do good as a way to get in front of the new meta-human uprising. It’s never clear why Waller is as hard-nosed as she is, Ayer gives her no backstory or even a kernel of a hint as to her motivation and Davis plays her with uncharacteristic vacancy. Assisting Waller in keeping the rag tag team in line is Rick Flag (Joel Kinnaman, RoboCop), Lt. Edwards (Scott Eastwood, The Longest Ride) and the ghost-blade wielding Katana (Karen Fukuhara). Bringing the team together occupies the first hour while the second is filled with their first mission when they learn to stop thinking about escaping and start working together. When the Enchantress goes all magically evil, Waller sends the Suicide Squad in to stop her, leading to low stake fights on dark soundstages with poor CGI creations and terrible dialogue of quippy one-liners that fall flat. Throwing in some twists that lazily wriggle more than they interestingly tangle, the picture sputters through its overblown finale before giving up the ghost and paving the way to Wonder Woman and Justice League in 2017. Smith and Robbie are interesting enough in their roles, though to call Robbie a breakout star based on her performance here is not that accurate. Sure, she’s probably the flashiest thing about the film but when it’s based purely on sexuality instead of characterization you have to wonder who the role is ultimately in service to. Much has been made of Leto’s wild methods in his creation of a new Joker but he’s in so little of the film that whatever impression he was supposed to make is likely on the cutting room floor…which is fine because when he does show up he’s so terrible that the less you see him the better. It’s fitting that Delevingne and Kinnaman’s characters are linked by love because they’re both dreadful, with Delevingne working her eyebrows and lisp into a frenzy whenever she’s threatened. Courtney and Akinnuoye-Agbaje barely register while Hernandez is the only vaguely root-able character in the whole bunch. Now that Suicide Squad is open and will likely make a killing at the box office this weekend, on Monday morning I’d expect some heads to roll over at Warner Brothers as a way to exorcise the demons that the studio simply can’t shake. There needs to be a bit of cleaning the slate if there is any hope of saving future installments in this DC Universe. Hopes are high that Wonder Woman can give critics and audiences what they want, a decently composed intelligent adventure that’s not so damn dark.